A newly described fossil species of porpoise had a record-breaking lower jaw that stuck out a full 7 inches beyond its upper jaw, the farthest measured in any mammal living or dead. It was even more bizarre than Jay Leno's jaw; not just a lantern jaw but a flashlight jaw. The lower jawbone looks like a giant chicken's wishbone. The fused portion at the front tip of the jaw, called a symphysis, amounts to 40 percent of the jawbone's total length. Porpoises are the smallest relatives of the whales, smaller and stouter than the dolphins. 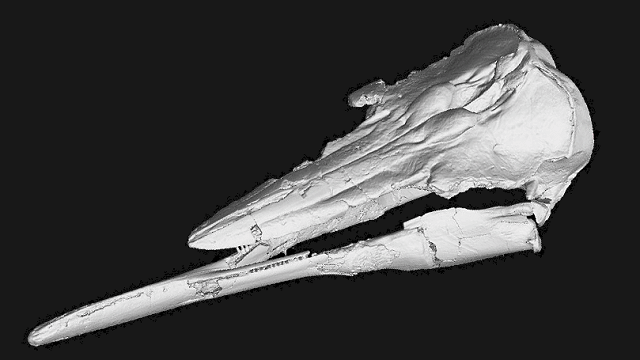 A beautifully preserved skull collected in Southern California is described in detail today in the journal Current Biology as part of the formal christening of a new porpoise species. The authors assign it the name Semirostrum ceruttii, the generic name Semirostrum meaning "half-beak" in scientific Latin and the specific epithet ceruttii honoring Richard Cerutti, who first collected the species in the 1990s. The team of paleontologists behind the paper, led by Rachel Racicot of Yale University, looked closely at the long symphysis and found abundant openings in the bone that once held nerves. This was not like the sword of a swordfish, but a highly sensitive jaw that served as a probe as the porpoise hunted for its prey. Racicot assumes that like its relatives the living porpoises, it fed on small fish and shellfish in a shallow nearshore habitat. The rocks holding the fossils tell us about that habitat. The San Diego Formation, where Cerutti collected the type specimen, is largely a soft sandstone made of fine sand. The Purisima Formation, where other bones have been found, is a similar body of rocks cropping out irregularly in the Bay Area. Both represent the fine-grained sediment that once lay on the bottom of large, shallow bays in the California coast around 5 million years ago, in Pliocene time just before the beginning of the modern era of ice ages. Sea level was high at the time and the land was warm. These bays were large enough and stable enough to support the evolution of specialized feeders like Cerutti's half-beak. Racicot's team found only two other animals with comparable faces: a bird, the black skimmer Rynchops niger and a group of half-beaked fish called Hemiramphus. They note that these species mainly hunt at dawn, dusk or night and rely on their sensitive beaks in those dim conditions. Porpoises, like other cetaceans, use high-pitched sound to map their surroundings. And the pattern of tooth wear in Semirostrum ceruttii matches what would happen to such a hunter whose jaw occasionally dipped into fine sand as they swam the ancient California seas. 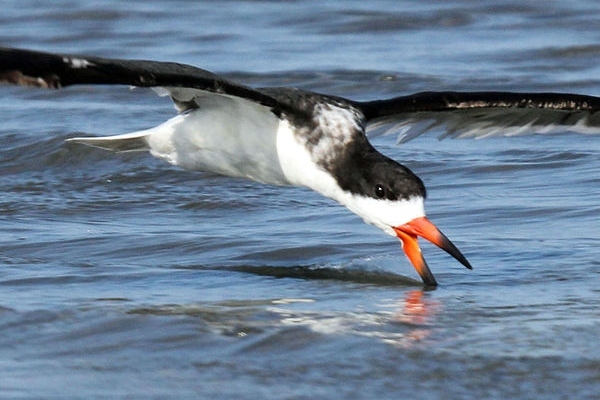 The long lower beaks of these species help detect prey and guide into their mouths. The extinct porpoise had neck joints and muscles that fit this hunting style, Racicot notes. I picture the Pliocene setting of coastal California as a large habitat that brought forth a variety of sea mammals, each exploiting a specialized niche. Racicot's team hypothesizes that unlike other porpoise species Semirostrum ceruttii foraged along the bottom, its sensitive beak giving it an extra edge in dark or muddy waters similar to the behavior of modern river dolphins.